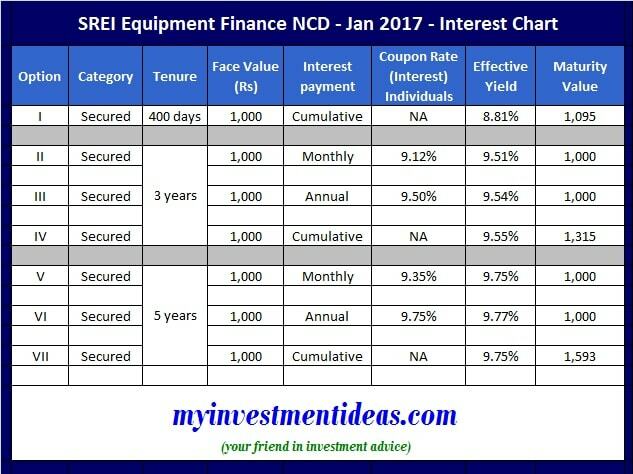 After about 2 years SREI Equipment finance is coming up with secured NCD’s which offers 9.77% yield. SREI Equipment Finance is one of the leading non-banking financing companies in the organized equipment financing sector in India with a principal focus on financing infrastructure equipment. Issue Closes on : 20th January, 2017. Interest Rate or Coupon Rate on NCDs : The ROI ranges from 8.6% to 9.75% depending on the category of investor and tenure of the NCDs. Mode of Issue : Physical & Demat forms, subject to certain conditions. Available Tenor options : 400 days, 3 years & 5 Years. Frequency of Interest payment : Monthly, Annual & Cumulative (on maturity date of NCDs). Listing : The NCDs are proposed to be listed on BSE & NSE stock exchanges. Credit Ratings : BWR AA+ – Outlook Stable by Brickwork Ratings & SMERA AA/Stable’ by SMERA Ratings Ltd.
Issue Allocation Ratio : 50% of the issue is for retail & HNI individual investors (HNIs – individuals (applying for an amount of > Rs 10 lakh). There are no PUT & Call options for these Secured NCDs. (What are Put & Call options? – NCDs can have Put or Call options. If a company issues a ‘Callable Debenture’, it means that it can be redeemed by the Issuer (company) before the bond’s maturity. Allotment of NCDs is on ‘first come, first served’ basis.